Outline: Contrasts Satan and God - their attitude toward man and their purposes. Results of following each. Description of heaven and hell. Sinner's prayer. My friends, listen to this message. It is true. It is from God's Book. In the world there are two chiefs. The name of one is God. He has no sin. He is only good (character). The name of the other chief is Satan. Satan is bad. He is the father of all evil. Satan hates all people. He hates God. He brings fear and death. Satan's place is the place of fire. It is the place where God is going to punish Satan and all evil people. People in this place will be sad. They will cry and have great pain all the time. Satan's road leads to this place. It is a road of evil. Many people walk on this road. They steal; they tell lies; they talk bad. They do not want God. If they walk Satan's road all the time, when they die, they will go to Satan's place. God is the Great Chief. He is stronger than Satan. God loves all people. He gives joy and peace (rest) to their hearts. He wants all people to have these things. He wants people to love Him. God has a place. It is a very good place. People who go there have joy all the time. There is no hunger or pain. There is no trouble or fear. There is no darkness. There is no sickness and no death. There is no evil there. Those who walk on God's road go there when they die. Everyone in the world begins walking on Satan's road. He is their chief. They are his followers. Jesus, God's Son, is the only one Who is able to deliver them from Satan's hand. Jesus made the road that goes to God's place. He died in order to do this. His road is the good road. He leads the people who walk on God's road. They have left Satan's road. They have left their bad ways. They are sorry because they have done bad things. They know that Jesus died for them. They know that He received the punishment for their sins. Doing that, He made their payment. God has given them a new life. He has given them strength to live correctly. Many people want to go to God's place when they die. But they do not know the road. God's road is the only road that leads to God's place. There is no other road. Some people think they are strong. They think their good ways are enough, without Jesus. 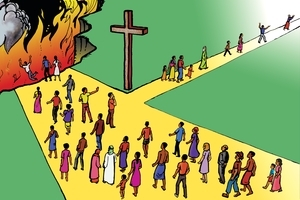 These people think they have their own road to God's place. One day they will find that their road is too short. It will not take them to God. They will be very sad. They must leave their own road and get on God's road in order to go to God's place. All people do bad things. We cannot go on God's road with evil in our hearts. We cannot take evil into God's place. We cannot enter God's road unless Jesus takes away our sins. He died for us so He could cleanse our hearts. Do you want to go to God's place? Tell Jesus you want to walk on God's road. Talk to Him now. He always hears you. If you ask Him, Jesus will cleanse your heart at once. He will deliver you from the control of Satan. He will put you on God's road. Then God will be your Big Chief. When you walk on God's road, you must never return to Satan's road again. You must leave all your evil ways and turn to Jesus only. God made us a promise. This promise is in His Book. God says, "If you walk on My road, I will not leave you." When you die you will go to God's place immediately. You will stay there forever. If you want to walk on God's road you may talk to God in this manner: "Oh, God, I want You to be my Big Chief. I will leave Satan's road. I will leave all my evil ways. I want to walk on Your road. I know that Jesus died to cleanse the evil from my heart. He made the payment for my sins. You have great power. I beg You to cleanse me and help me to walk on Your road. When I die, You will take me to Your place. I thank You. In Jesus' Name. Amen." GRN has recorded a version of this script in 333 languages and dialects. See full list. See different versions of this script in Portuguese.